iOS Application, available now in the app store. 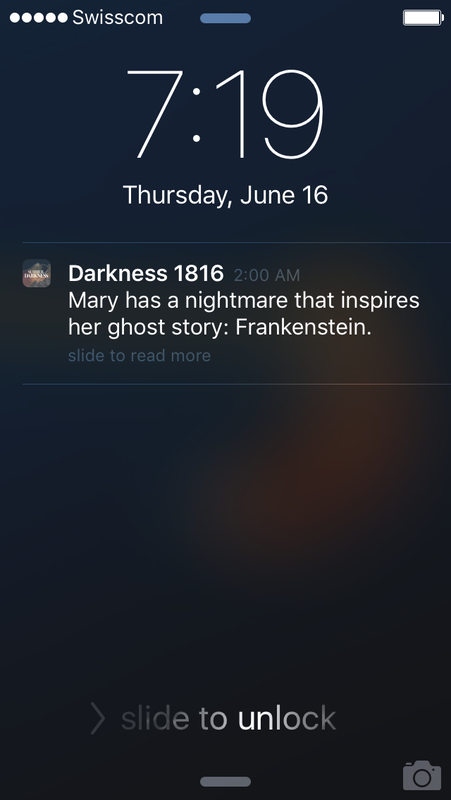 Story is told in "real time" 200 years later, via iOS push notifications. App can also be read in sequence as an e-book, after all content is unlocked. Atmosphere is generated using weather data collected in 1816. A custom tool was built to develop and test the game timeline. How can an archive tell a story? Between 1812 and 1815 several large volcanoes erupted. Ash accumulated in the atmosphere and changed weather patterns worldwide. 1816 became known as the Year Without Summer. The average global temperature dropped by several degrees. Crops failed, many starved, and the normally beautiful Swiss summer was shrouded in gloom and rain. The world was prophesied to end in July. Summer of Darkness is an iOS application designed and developed to celebrate the 200th Anniversary of the year without summer. Installing the app will tell the story to you in “real time” via daily push notifications. How do you handle a story told across history? How do you account for timezones? How do you create an experience that is compelling at different time scales? One challenge of this project was to convey a “live” experience while also creating an application that was enjoyable before and after the anniversary summer concludes. Summer of Darkness is a performance occurring over a specific period of time, from May to September of 2016. While initially we designed all notifications to occur at "local" Geneva time, we made the narrative decision to deliver content in your local timezone instead. Thus if an event occurs at midnight (Geneva time) you will get the notification at midnight regardless of your current timezone. This is a small example of many decisions we made regarding the treatment of the material. In the end, the result of this performance is a kind of “e-book” which can be read and referenced at any time in the future, meaning that the application can be used differently at different timescales. The decision to tell the story via push notifications linked to longer text excerpts also allows the audience to choose their degree of engagement. Many users report simply enjoying the notifications throughout the day wether they read the longer content or not. The weather during the summer of 1816 was unusual enough that we have recorded weather data from that period. This data was digitized by Swiss researchers for a paper on contemporary climate change. This data was imported into the application and is used to drive a custom designed “weather engine” capable of simulating cloud cover, rain, lighting and wind direction. From a design perspective, the challenge was to create an atmosphere which added to the experience of reading the text without distracting too much from the reading experience. 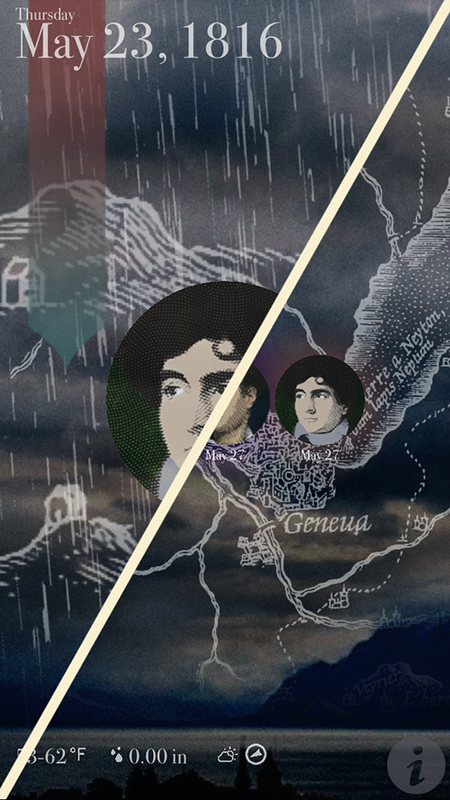 Weather effects are visually subtle, although the severity of the weather is occasionally exaggerated to emphasize the narrative. The weather data displayed at the bottom of each screen is the actual data recorded in 1816. Digital Humanities is often used as shorthand for "big data" analysis of archives, but in fact this is only one of many possibilities that computation brings to our understanding of the humanities. 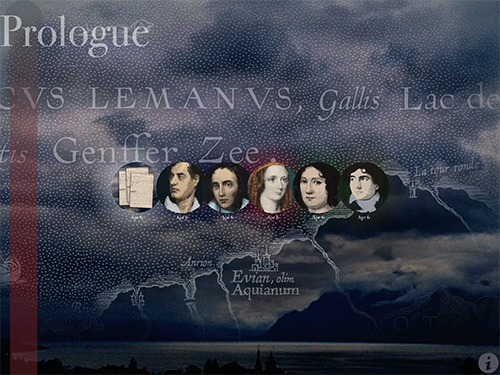 Summer of Darkness is an exploration of an archive - it is a story told not with the primary texts, but with the "metadata" surrounding the creation of well known documents. Summer of Darkness draws on personal correspondence, historical documents and a few carefully chosen works that were created during the period. Overlaying history on a contemporary timeline allows for a narrative context-collapse, expanding enjoyment of the story and increasing contemporary relevance of historical content through moments of personal synchronicity.